The UGLee Pen is a revolutionary ergonomic pen that is designed, created and used by a real physician. This Doctor-inspired grip pen is redefining the way people view pens and writing. 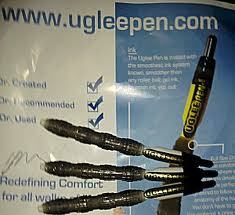 I received a pack of 3 UGLee Pens~ I luv these pens they are so comfortable to write with and easy to hold. These pens fell so great that I have lost 2 already to the kiddos! You knwo if the kids like them then they are great pens! When the ink runs out you can purchase ink refills in packs of 10 for $15. Giveaway~ Enter the rafflecopter entry form below to win a pack of 3 valued at $19.99. 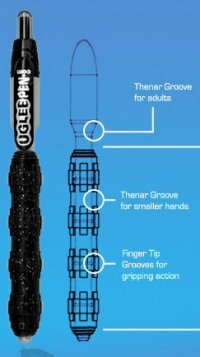 What a great pen for old and young alike. Looks like a great pen. Stoppin' by on the Tiptoe Tuesday Blog Hop. You can find me at Check it Out! with Dawn. Looks like a great pen! I don't write much anymore, but would love to try one out. I love pens. I've been told that I'm a pen whore. This would be awesome!! I've never seen these before. I've always wanted to try one of these, but never got around to it. Thanks for the opportunity! I'm still in college so I take notes and write all the time! I learned that the pen only weighs 11 grams. I was here and would love to try UGLee pens! these look kind of cool! I like the idea of these pens. I would love to try them. I hope I win so I can. I'm always looking for a new pen that won't cause my hand to cramp up. This looks great. These pens are great! Thanks for the chance to win some! I learned that Kids are also at risk for repetitive stress injury, in fact that can be where it starts! I was here! Thank you for the giveaway. These look awesome! I learned that they weigh only 11 grams!